The Bellagio – One of the most amazing sights in Las Vegas is the fountain display in the giant pool at the front of the hotel. It “performs” to music every 15 minutes in peak times, but you’ll need to be there in good time to get a good view. 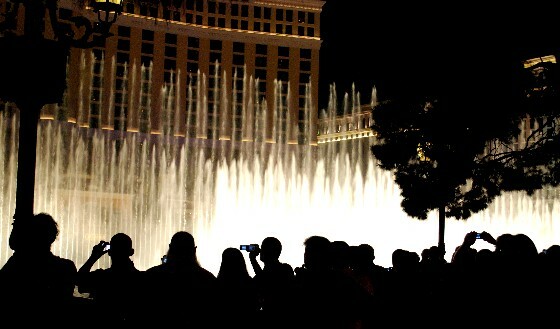 Without doubt, the fountains are the best free attraction in Vegas. Don’t miss out on seeing inside the hotel hotel too. It’s very luxurious with white gaming tables and an amazing indoor garden near the lobby desks. 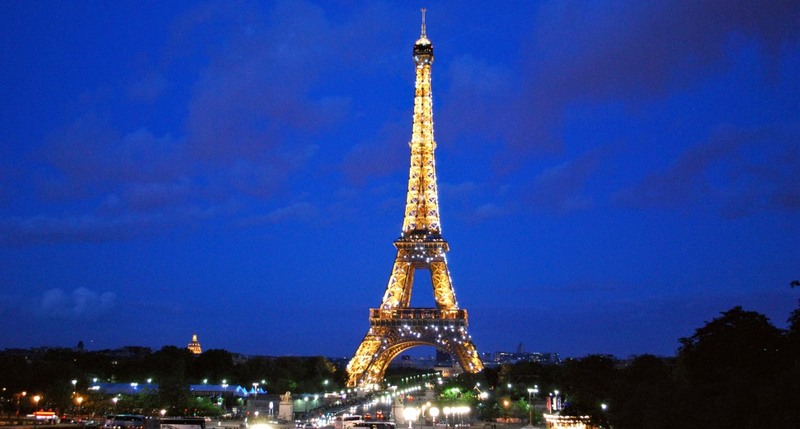 Paris – The highlight here is the mini Eiffel Tower which is about a 3rd the height of the original. We recommend the trip up the elevator to the top where there are some magnificent views of the strip (see above) – far cheaper than a helicopter ride! You’ll also find a mini Arc de Triomphe and the outside of the hotel is shaped like some of the traditional Parisian buildings like the Paris Opera House. 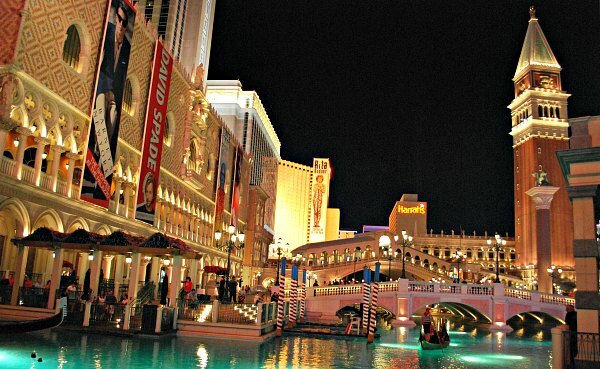 The Venetian – Outside this hotel are all the sights of Venice crammed into the frontage along the strip. 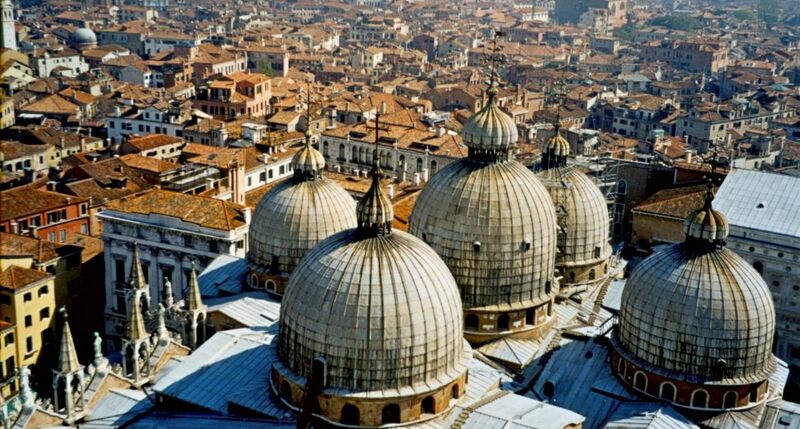 You’ll find re-creations of the Rialto Bridge, the Camponile and the Doge’s Palace, along with mini canals and gondolas. Inside the hotel, the shopping centre has Italian restaurants, more gondolas and a mini St Mark’s Square. You can continue your journey through the shops to the Palazzo Casino next door. 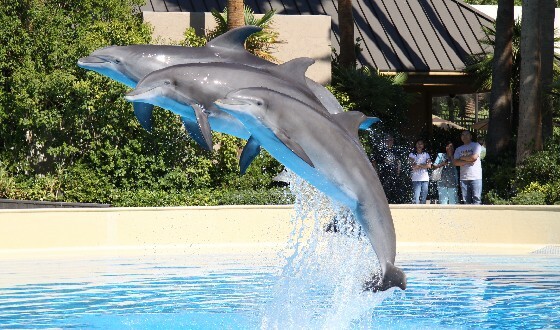 The Mirage – Two attractions we’d recommend here. The volcano outside “erupts” with fire, water and light every night on the hour from 8pm. It’s well worth seeing and last around 5 minutes. At the rear of the hotel though is Siegfried and Roy’s Secret Garden which is a sort of mini animal park. We will remember the dolphins here for a long time to come. 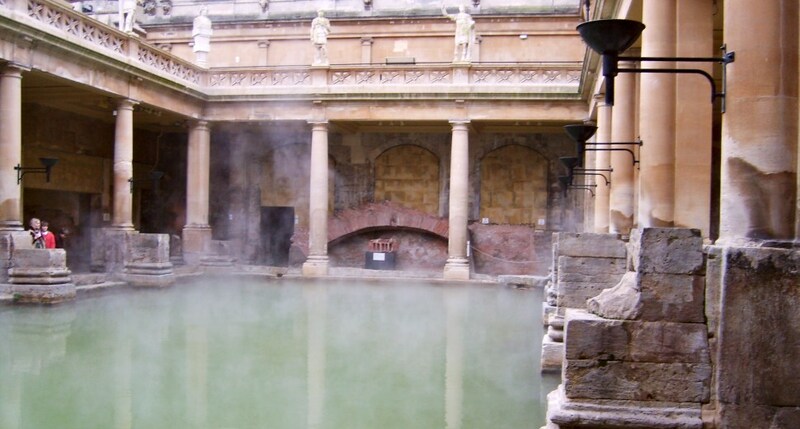 This is the closest we have ever been to them and they have lots of pools to swim in. There are no “shows” as these are not “performing” animals, but at most times of the day the trainers are interacting with the dolphins, so there’s plenty to see. 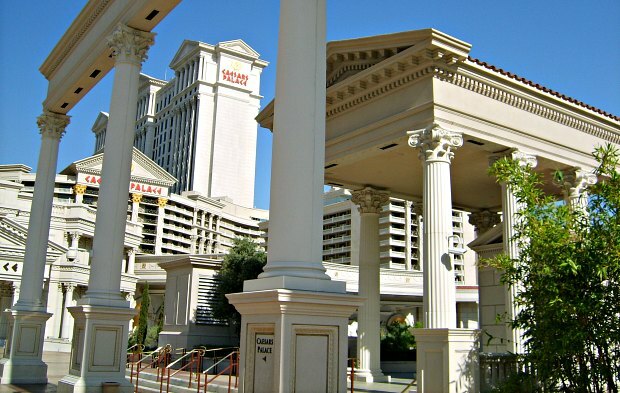 Caesars Palace – This place is absolutely huge! There are two Casinos, but at the rear of the hotel you descend to find a massive shopping centre which stretches back to the strip. Some of the fountains here are really worth seeing both outside the hotel and inside the shopping centre. 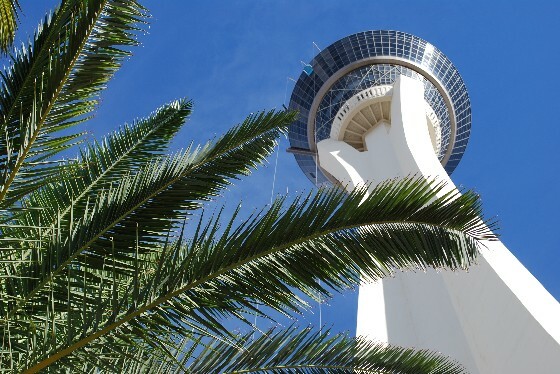 Stratosphere – This hotel has the tallest Las Vegas viewing area at the top of its tower. The view is good, although we prefer the view from the top of the Paris Eiffel Tower. The difference here though is the collection of thrill rides and experiences on the tower. The scariest of them all is the “Sky Jump” free fall where you are essentially dropped 855 feet to the ground in a harness! The hotel is quite a long way down the strip from the newer resorts and you’ll find it near to the Sahara. Aria – This is one of the newer hotels in Las Vegas and is part of the “City Center” development opposite Planet Hollywood on the strip. There are no free shows, but the fountain at the front is fascinating to watch with a range of different water effects. The hotel is also worth seeing, just to soak up the opulence of the place. You can ride the “City Center Tram” which goes past the front of the building for free too. Treasure Island (TI) – Not the most attractive of the hotels on the Las Vegas strip, but still worth a look. The big highlight here used to be the free “Sirens of TI” pirate show at the front. It involved huge moving ships and scantily clad performers staging a pirate “battle”. Sadly the show was axed in 2013 and some of the ‘siren’s cove’ has now been built on. We would however recommend the theatre show inside which is Cirque du Soleil’s Mystère. New York New York – From the outside the hotel has the appearance of some of the most famous buildings of the New York skyline like the Empire State Building and the Chrysler building. 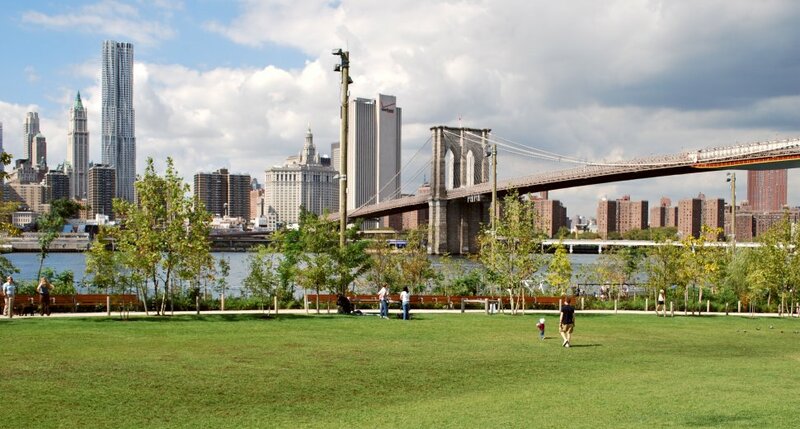 You’ll also find mini reproductions of well known landmarks like the Statue of Liberty and Brooklyn Bridge. Inside, the hotel has a mini theme park and we can thoroughly recommend the roller coaster which starts there and moves all around the outside of the building. 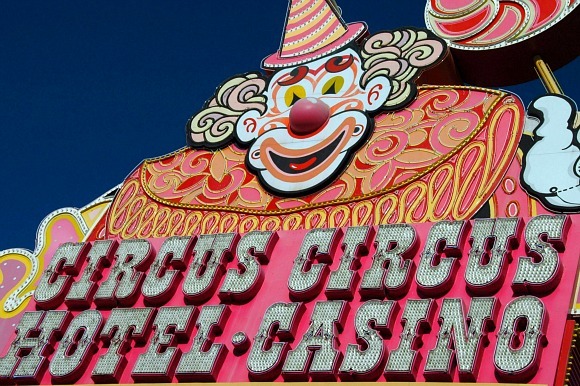 Circus Circus – This hotel is one of the older ones further down the strip, and it looks a little tired too. However, inside you can catch the daily 10 minute free circus trapeze shows and at the rear you’ll find a dome with all kinds of theme park rides and entertainment. 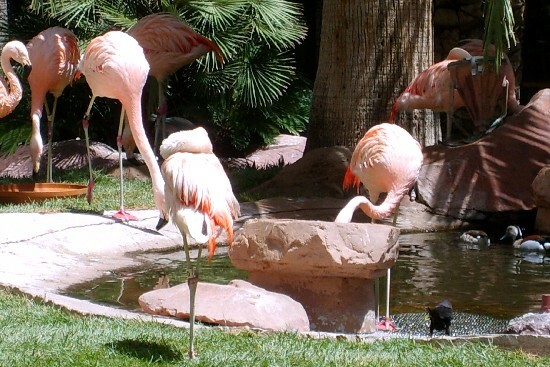 The Flamingo – Head through the casino to the peaceful garden at the back of the hotel where you’ll find real flamingos, huge Koi and a relaxed atmosphere. There are also a couple of new arrivals in the shape of two Pelicans. 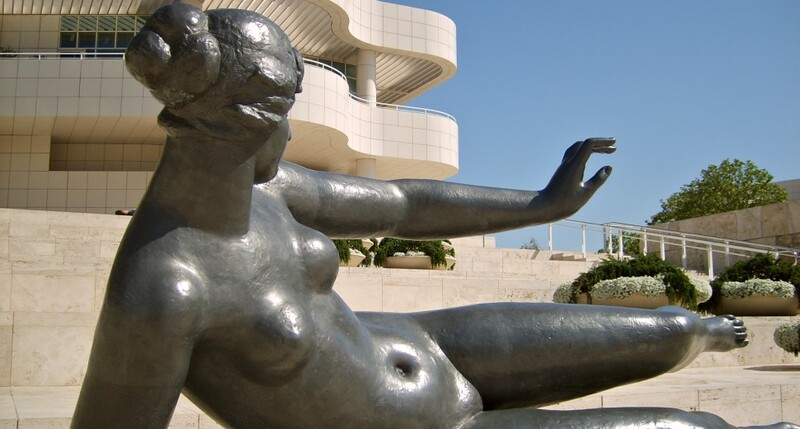 Wandering around the garden is one of the most relaxing things you can do on the strip and it’s free! MGM Grand – The big attraction inside this hotel used to be the free “Lion Habitat” located in the Casino. 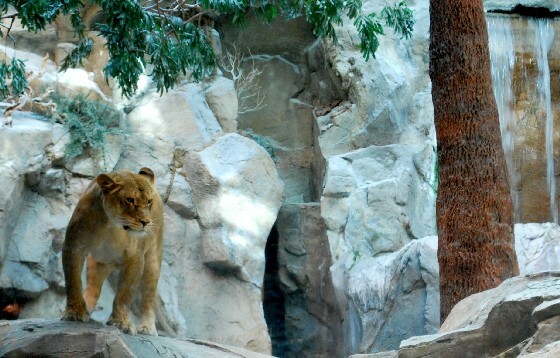 The lions are actually kept on a large ranch outside Las Vegas, but different lions used to come on different days to spend a few hours in the specially built enclosure which had running water, fake trees and is climate controlled to be the perfect environment for the lions while they watch the casino gamblers. Sadly the enclosure is now closed, but you can still see the lions at the ranch they live on. 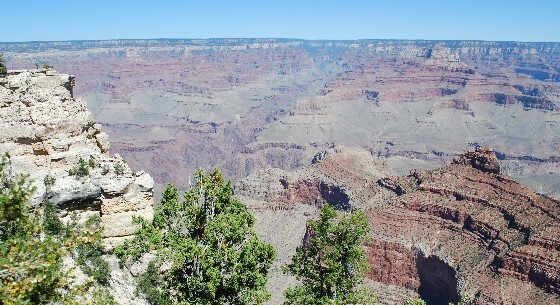 The Grand Canyon – We’d thoroughly recommend that you make the most of the proximity of Las Vegas to the Grand Canyon. 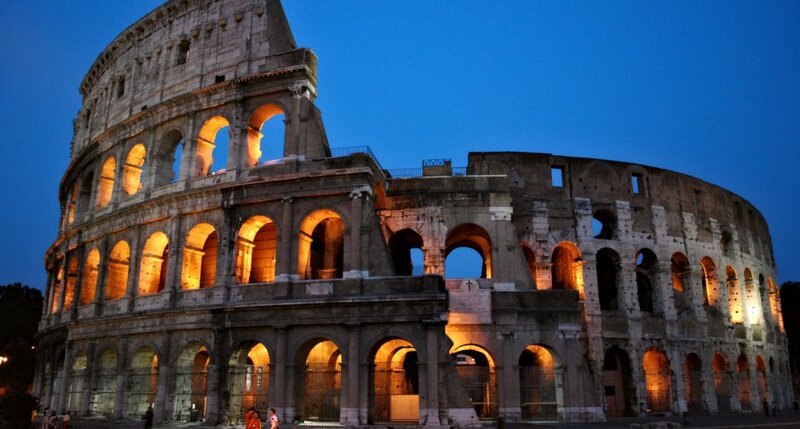 Tour companies and hotels will happily organise this for you and you can go by helicopter, small plane or coach. Many of the trips will touch down and leave you time to enjoy the surroundings. 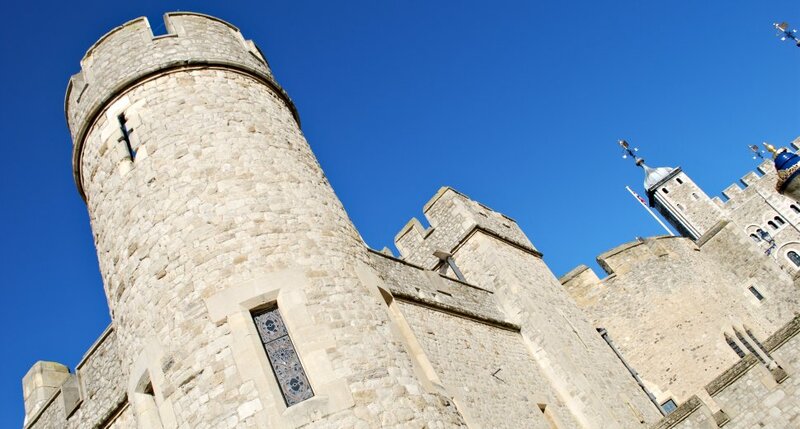 You need to decide what kind of trip you want though and one thing to bear in mind is that the coach options will involve many hours just to get there! 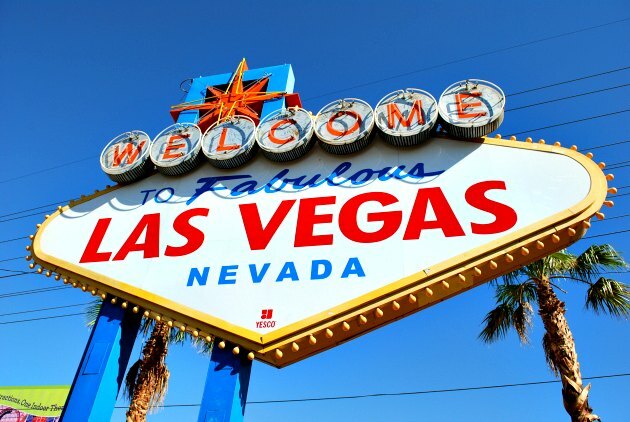 The Las Vegas Sign – The old neon sign on Las Vegas Blvd has been the sight that welcomes visitors to the city for decades. It’s now an attraction in its own right and there’s even a small parking area in the middle of the road so you can stop for a photo. If you want to walk, it’s about 10 minutes further along the strip from the Mandalay Bay. 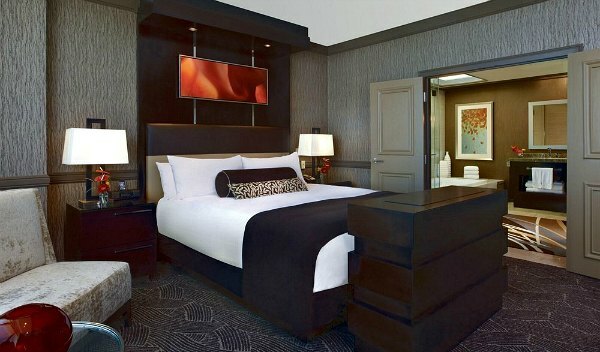 See A Show – Almost all of the hotels have their own theatres and you can see just about everything in Las Vegas ranging from Broadway musicals to big name singing stars. 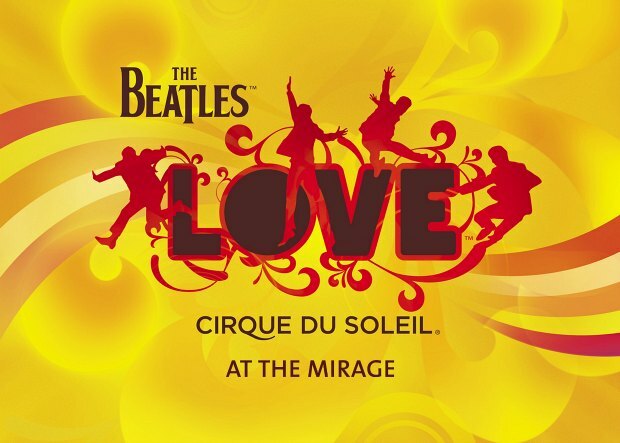 Getting top reviews at the moment are The Beatles Love show at the Anthony Cools at Paris at Paris Las Vegas. The Cirque du Soleil shows are big in Las Vegas too – they’re hard to describe but combine circus arts and street entertainment to create compelling stories with breathtaking feats. 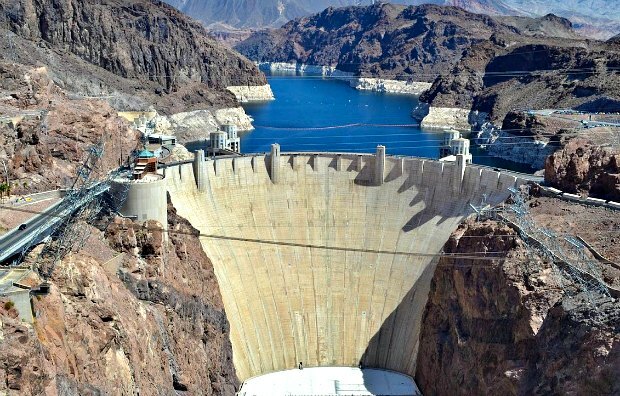 Hoover Dam – This is another out of town excursion you can take and it’s a truly fascinating structure to see. The Dam was a miracle of engineering when it was built and the lake it created, Lake Mead is absolutely huge! Travelling to the Dam takes around half an hour from Vegas in a hire car, or you can take one of the many organised trips. Some combine Hoover Dam with seeing the Grand Canyon. 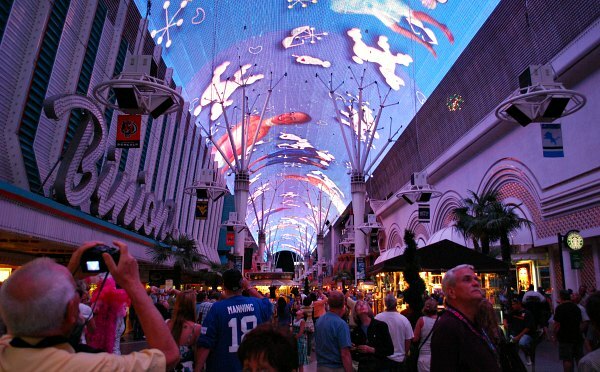 The Fremont Street Experience – Away from the modern hotels, Las Vegas has made a huge effort to attract tourists back to the old “Downtown” area where you’ll find hotels like the Golden Nugget. All the streets here are closed off and they’ve constructed a roof on which light and picture shows are shown. You’ll also see some of the old neon signs dotted around as exhibits in the Las Vegas Neon Museum. 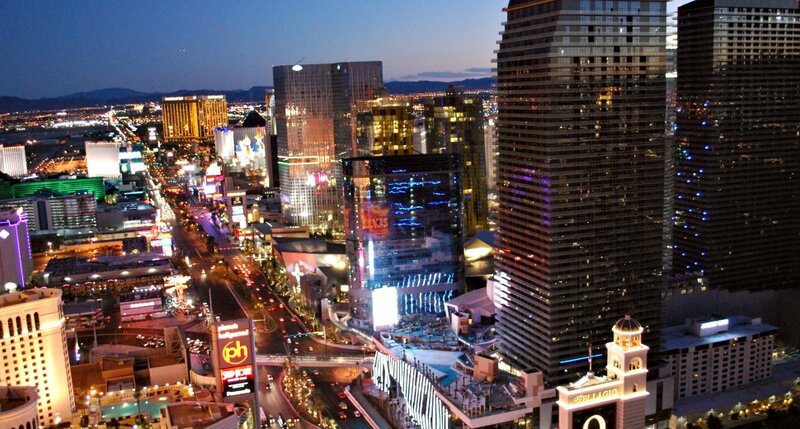 To get downtown, hop on the buses that run up and down the strip or for a quicker journey, hail a cab. 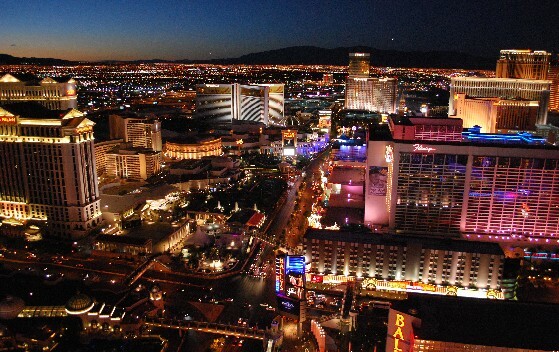 We would recommend staying directly on the strip if you can and since there are so many hotels available, there are often great deals to be had even at the best known hotels. We’ve stayed at Paris and Planet Hollywood in the past, of which Paris was better quality, but Planet Hollywood was a bit more contemporary. On our next visit we’re planning to stay at the Mirage because everyone we’ve met who’s stayed there absolutely loved it! Las Vegas is making real efforts to improve its public transport system and there are quite a few options now for getting around. One of the simplest is the Deuce busses which cruise the strip. You can buy single journey, 24 hour or 3 day tickets to get the best value, but the busses are fairly slow. 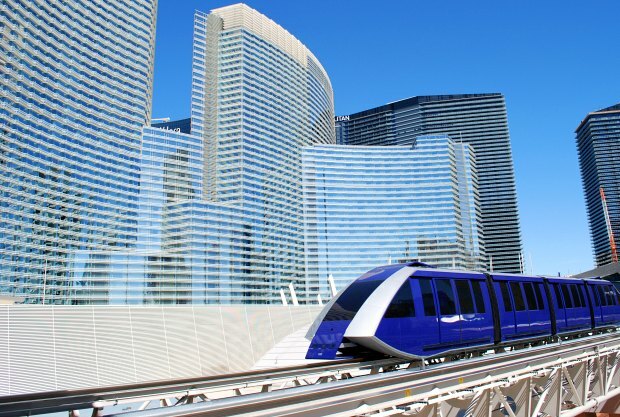 The Las Vegas monorail has stations at the MGM Grand, Paris/Bally’s, The Flamingo, Harrah’s, The Convention Centre, The Hilton and the Sahara. It’s not cheap though, so we only took it when our feet ached from walking the strip. Many of the hotels have free transport systems too, so make the most of them when you can. 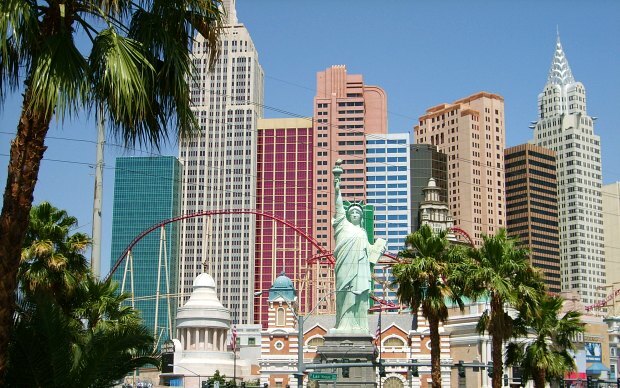 There’s a tram which runs from Mandalay Bay to Excalibur, the City Center Tram runs from Aria to the Bellagio and there’s also a little tram linking the Mirage and TI. Cabs on the strip are easy to hail and not that expensive.